It is just a wagon. But with a little imagination, there are no limits to what it can become. Robert Pasin, president and CEO of Radio Flyer, explained it: "It can be anything the child imagines it to be. It can be a spaceship, a train, a race car, a submarine." That versatility has given the iconic, fire hydrant red Radio Flyer serious staying power. As of next year, the company will have been around a full century. Its roots stretch back to the early 1900s. That's when the future founder of the company, Antonio Pasin, arrived in America. Settling in Chicago, he worked a series of odd jobs. He saved his money for woodworking equipment. "He did whatever work he could. He didn't have any money. He didn't know anybody," his grandson, Robert Pasin, said. By 1917, Antonio saved enough money to rent a one-room workshop. He began building phonograph cabinets and a variety of other objects upon request. He also built sturdy wooden wagons to haul around tools. "As people were buying phonograph cabinets they would say, 'hey, can I get one of those wagons?'" Robert said. "And pretty soon he was selling more wagons than phonograph cabinets." The popularity of the wagon as a toy grew from there. As demand increased, Antonio hired several employees and eventually called his wagon Radio Flyer. He captured the two obsessions of the time: radios and airplanes. For a simple wagon, the Radio Flyer was innovative in its design. Antonio integrated the relatively new methods of automotive assembly lines and metal stamping to keep costs low and production rolling along. In the late 1920s, the metal wagons sold for just fewer than three dollars. That is roughly 40 dollars in today's economy. This approach to manufacturing earned Antonio the nickname, "Little Ford." The flashy red color became a mainstay for the Radio Flyers. Over the years, the company tried many colors, but red always zoomed ahead of the others in sales. Times weren't always easy, however. As the Great Depression rippled through America in the 1930's, the company struggled. But it survived. That was "something that a lot of toy companies didn't do," said Gary Cross, a historian specializing in consumption, leisure and childhood at Pennsylvania State University. Even in the depths of the downturn, the company sold around 1,500 wagons a day. "Even people who were unemployed and saw their wages decreased felt the need to preserve a certain kind of normalcy with their children," said Cross. "And that meant gifting them." Antonio's wife, Anna Pasin, who recently passed away at age 107, described this as the only time she ever saw Antonio nervous. "He made a big bet financially," Robert said. The massive art deco structure housed a kiosk. Inside, Anna helped work a mini assembly line putting together tiny steel wagons that sold for just 25 cents each. That is $4.56 today. They sold more than 100,000 of the trinkets. "That was just a brilliant brand-building idea, because the World's Fair was such a huge deal," Robert said. It was during the 1950's that the little red wagon cemented its status as an American icon. The company touted the wagon as a hardy American toy. Antonio died in 1990 at age 93. When his son, Mario Pasin, passed the business down to Robert in 1997, growth was at a standstill and the company was only marginally profitable. The first plastic Radio Flyer was too small and foundered. The second and third similarly tanked. Today, Robert has reinvented the company. He has done it by focusing exclusively on children's toys and moving manufacturing abroad. It is one of America's fastest growing private companies. Radio Flyer now offers a lot of products. Though these are important for the company to keep pace with the times, nostalgia is key to the allure of the wagons. People give their kids what they fondly remember from their childhood, Penn State's Cross explained. I actually have one of those radio flyers i got it from a garage sale. That's very true how there are no limits to imagination for those i used to play with that wagon all of the time. The radio flyer was a popular toy during the early 1900s. 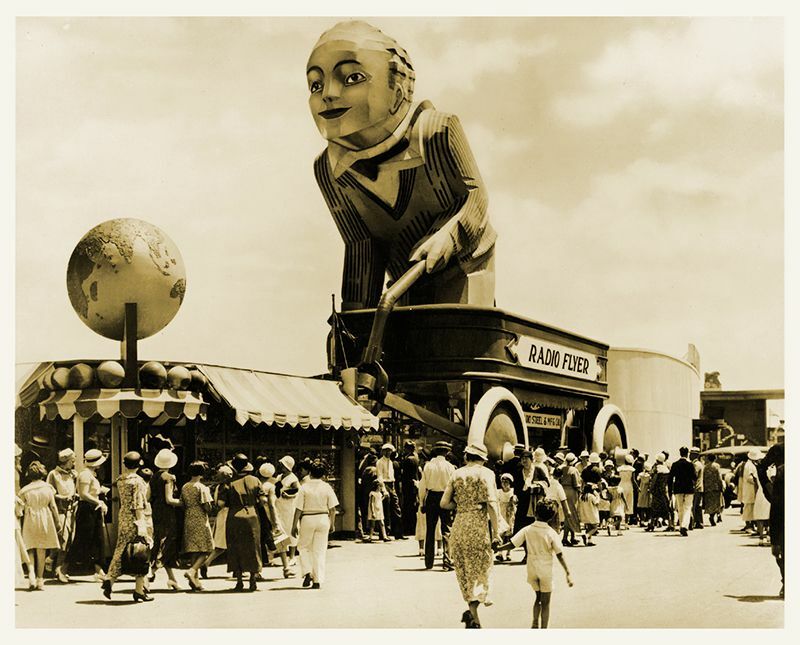 Even throughout the Great Depression the wagon remained prominent. After the company went in a downfall, Pasin's grandson picked the company back up. Because airplanes and radios were considered cool back then and still are. Because radios and airplanes were new and mysterious. Being able to listen to music without having to go out and find a band was spectacular. And then of course man always had the dream to fly. People loved the idea of flying so much and the airplane did just that. This made the radio and airplane some of the most amazing and popular gadgets around at the time. Wow... I have 3 Red Flyer wagons, they were really old and countless times I'd gather grapes in them from my grandmother's garden, but I never realized the complicated history behind this, and never realized... or even considered that this brand survived the great depression! This is amazing. 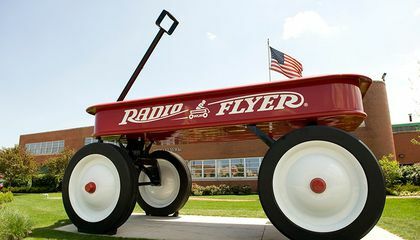 I always wondered why the wagons were called radio flyers and know i know.